Blog • Company Stories • Partners • Travel + Epic = Trepic? #FantasticWorldTour! Travel + Epic = Trepic? #FantasticWorldTour! What is a “Trepic” when it’s at home? For Brett Nottle and Solène Abauzit, it used to be the title of the document on which they planned their around the world travel dream. Now it’s a fully realised journey plan featuring seven continents, one sturdy custom 4×4 and two intrepid adventurers who are being sponsored to take on the Antarctic and Siberian winter amongst other sights and challenges. It’s sure to be a fantastic trip. Which means it only makes sense for them to have a certain sponsor. We sat down with the dynamic duo and asked them a few questions about their upcoming adventure. Who are Brett and Solène? Hi guys! So where are you from and how did you get into travelling? Brett: I’ve always been into travelling. My hometown is Three Springs, Australia. It’s got a tiny little population of about six hundred. I started travelling when I was 19. New York was my first stop and it was a bit of a shock to the system! Solène: I would say so! I was born in Ardèche. If you haven’t heard of it, I swear it’s the only part of France where there is no airport, no train, no motorway! I moved to Australia four years ago. It was my first passport and I’d never used it before. So what do you both do “normally” in terms of career? Solène: Well, when I moved to Australia I spoke almost zero English so I had to try being a waitress for a while. It was quite a change of career plan but it’s worked out well! Now I manage what we humbly like to think of as one of the best restaurants in Perth. Brett: Humbly, that’s the one. I have to admit I’ve had a few jobs down the years and been a terrible employee at most of them. I never found anything I liked until I started working for myself. I started a meat wholesaling company (who knew, right?) and then opened a restaurant with a mate of mine. We didn’t have a clue what we were doing when we started out but these days we’re pretty successful! What are you hoping to get out of your Trepic? Solène: I want to see the rest of the world. I want to learn about different cultures, people, food, education systems… everything! I’ve lived lots of my life in one of two places but I don’t want to go through the rest of it without understanding how the rest of the world lives. I also feel like I’m fighting against time a lot in my day to day routine. So I’m hoping this trip helps me open my mind. Brett: For me, this trip is basically my dream. I’ve been lucky enough to have travelled a lot around the world but it’s always been with a backpack. Having our own vehicle will give us so much more freedom. And do your friends and family think you’re crazy? Brett: Ha, well maybe! But we’ve known each other my whole life so I think they probably knew that about me already. But they weren’t overly surprised I don’t think. They’ve gotten used to me heading off these days. They were pretty shocked at how much more interest this trip has gotten though! Are you planning on going right around the world? 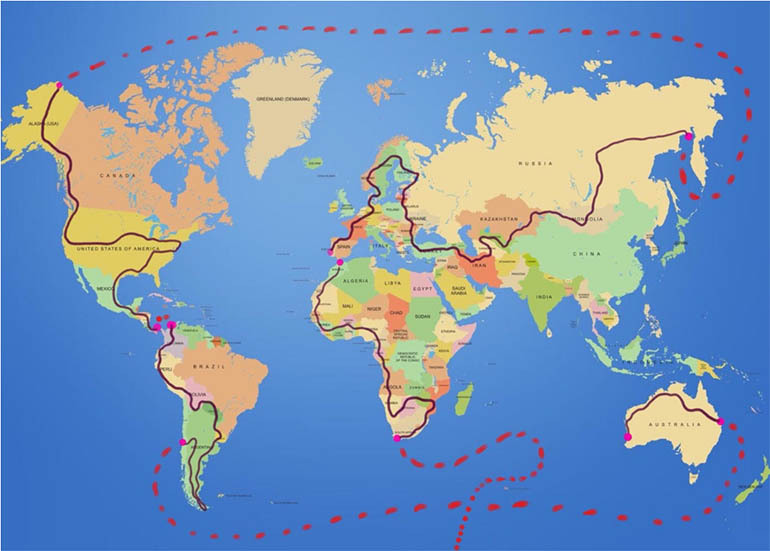 Solène: We are actually planning on driving across all seven continents, each of them at the longest possible point. That means at one stage we’ll need to get from the tip of Africa to Antarctica. Brett: Yeah the logistics of that are going to be difficult as we’ll be using the same vehicle. We’ll need a whole team to manage it. Solène: But if we can achieve it I think we’ll be the first to ever drive the same car across every continent. Brett: Probably the bits I’ve never done before. Even though one of them is probably one of the things I’m most worried about – driving through Siberian winter. It’s going to be cool – well, freezing cold obviously – but also very cool. I’ve never been to somewhere where the daytime temperature is less than five degrees Celsius. I want to drive down the middle of Africa too, though that’s not looking very advisable at the moment. But here’s hoping! I also want to see Hell’s Gate in Turkmenistan. Back in the sixties there was an accident when drilling for gas and there was a huge leak. As it was close to a town, the genius in charge thought the best thing to do would be to light it*. It’s still burning today. I just love the story and can’t wait to see it. *Author’s interpretation – even though it’s a hell of a place, the birth of Darzava gas crater happened a bit differently, according to Wikipedia. Solène: I think I’m definitely considered a “new traveller” so I’ve got a big list. I want to have a shower in the waterfalls in Nicaragua, see the Grand Canyon, walk through pine forests in Canada, drive through the ice in Alaska, climb the sand dunes of the Gobi Desert in Mongolia at night again, eat cured meats in Portugal, look at North African architecture, explore Cape Town… should I go on? Those are just the highlights! I’m also looking forward to visiting my mum and dad in France. Brett: Ha! Unfortunately, yeah there’s no insurance once we leave Australia. So if anything happens to the car, it’s game over. Solène: I’ve got a big worry that something stupid like it falling into the ocean’s going to happen… but less said about that, the better. I’m a believer in saying something out loud makes it come true. Brett: Also, Siberia. That’s going to be cold. What is this magical vehicle you keep mentioning? 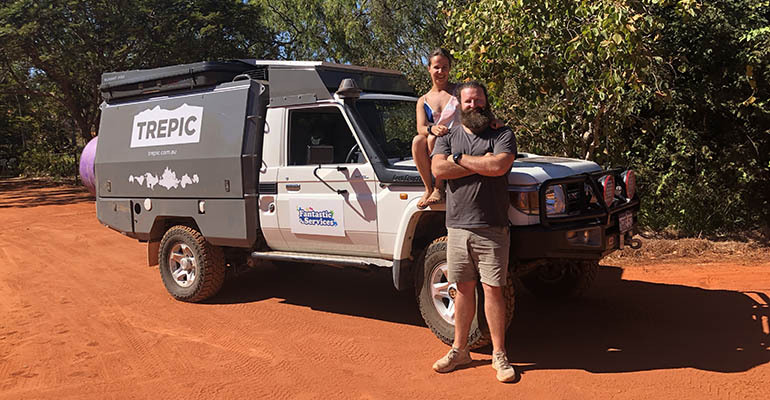 Brett: It’s a Toyota Land Cruiser Ute, so I guess that’s a pickup or a truck depending on what part of the world you’re in. But it’s pretty heavily modified. Solène: We spent around three years trying to perfect our house before we decided on this trip. Now we’ve tried to fit all of the things we wanted in the house into the ute. So that means a bedroom, bathroom, open plan kitchen… with a wine cellar obviously. That sounds like you could live in it for quite a while! Brett: Oh yeah. That’s the idea! Solène: The trip will hopefully take about two years or more so we need to be properly kitted out. How did your sponsorship with Fantastic Services come about? What’s the link between you and Fantastic Services? Brett: I’ve known Anton, one of Fantastic’s founders, for years. He was one of the first who believed in the idea of the trip. Solène: We’re also being sponsored by some other lovely people. So thanks, guys! Brett and Solène, thank you very much! You can follow more of Solène and Brett’s journey on Facebook and Instagram. Search for #FantasticWorldTour. Of course, we’ll be keeping you up-to-date on Trepic’s progress here on the Fantastic Services blog, too as well as on our social media channels on Instagram, Facebook and Twitter.